There aren’t many foods I have a distinct memory of first discovering. There are, of course, many meals I remember that gave me a new appreciation for a food that was already familiar, but very few instances whereupon having something for the first time I also fell under its spell. For years, I knew nothing of fennel—beyond its seeds, which are key to so many Italian meat dishes—scared off by the fear that the root and stalks would be too licoricey for my taste. That all changed the first time I had roasted fennel root. About a year after my wife and I began dating, she briefly worked near a weekday farmers’ market. One night she brought home a collection of root vegetables, including a large, milky fennel bulb. While I generally do most of the cooking, the market’s haul were her babies and she prepared a simple meal by roasting the sliced vegetables with olive oil, balsamic vinegar and some herbs. Having never before tasted fennel root, I was impressed and relieved by it’s mellow, sweet flavor. It quickly became a regular in our vegetable rotation, especially in the colder months, when hearty, roasted vegetables help to warm the belly. Since eating at the very tasty Ubuntu Napa a month ago, I’ve been eager to make a meal where a vegetable that is typically served as a side moves center stage. 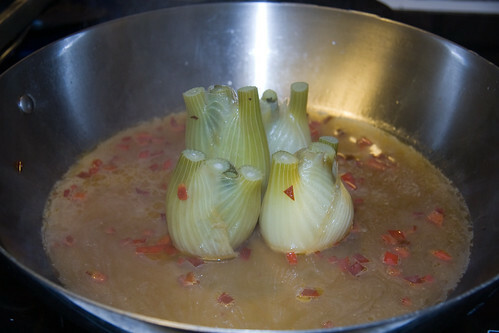 Fennel seemed like a perfect choice, with the bulbs standing in for a shoulder roast, in a slow braised preparation. 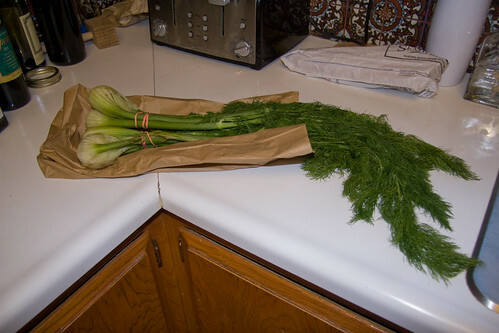 I bought 4 medium fennel stalks from Capay Organic at the Davis Farmers’ Market. The bulbs I got were each a nice palm size, allowing them to be easily handled whole. 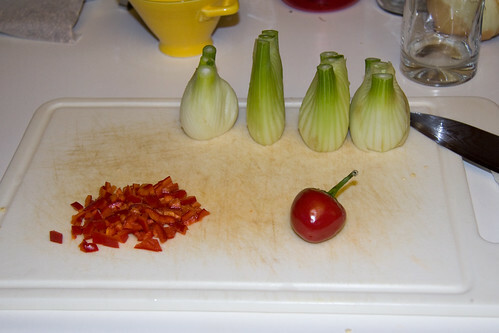 I washed and trimmed each fennel bulb, and chopped two cherry bomb peppers, a fairly mild pepper varietal that nicely balances sweetness and heat. 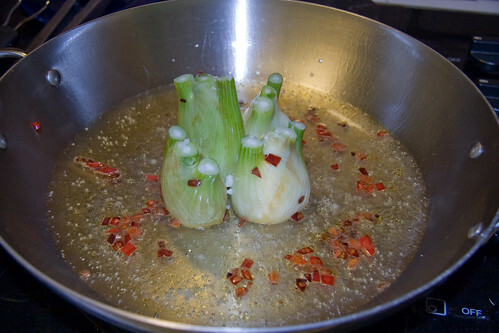 I sautÃ©ed the peppers in a few tablespoons of olive oil until their skin began to pucker, then added the fennel bulbs, searing them on each side just as I would a roast. 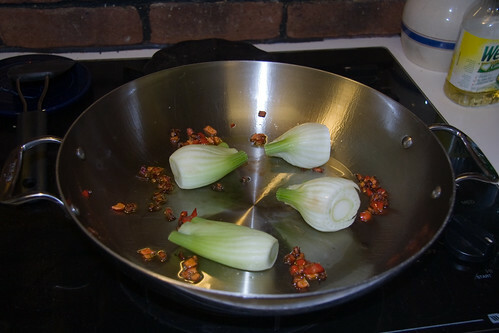 Once the bulbs were seared on all sides, I placed them upright in the center of the pan, added about 8 ounces of beer (Sudwerk Pilsner) and reduced the heat to low. The fennel cooked for about 40 minutes, until it was soft but still nicely intact. 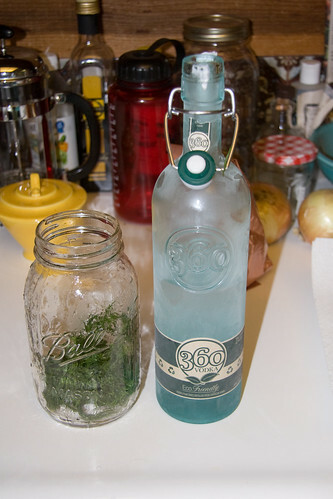 While they cooked, I took advantage of the plentiful fennel fronds by placing about 4 ounces of them in a pint of vodka to make what I hope will be a heady, dry anisette. 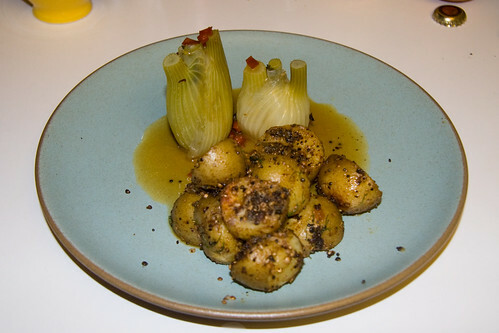 We plated the fennel alongside a spicy potato with mustard seed recipe we got from Sunset, and poured a reduction of the braising liquid over it. Checkout all the photos here.